The Aquanaut dive is a 55-foot-long wooden tug boat located 75 feet down on the Middle Sambo Reef off the Florida Keys. Since this dive is in deeper water, it is most appropriate for an advanced diver. If you're familiar with Alexander's Wreck, then you'll be interested to know that this is a related wreck. Alexander's Wreck is a shallow dive to an artificial reef created out of the wreck of the Naval destroyer USS Amesbury. The Aquanaut tugboat belonged to Chet Alexander, the marine salvage purchaser of the USS Amesbury. Alexander was the person who sank the Amesbury to create the artificial reef that is now home to many species of fish. The Aquanaut is also now a reef; originally it sank in shallower waters. Alexander decided that it was too expensive to refloat and rebuild her, but that she would be more useful to sea life if she were towed out to deeper waters. The Aquanaut's wreck is now located close to the Gulf Stream, which makes the visibility underwater quite good. It also means there are sometimes strong currents, which adds to the challenging conditions and may deter some intermediate divers. This site is too difficult for a beginning diver. Since the Aquanaut was made of wood, her remains are now scattered and rotten, so she is no longer very interesting as a ship, though her larger pieces have become very lively coral reef sites. 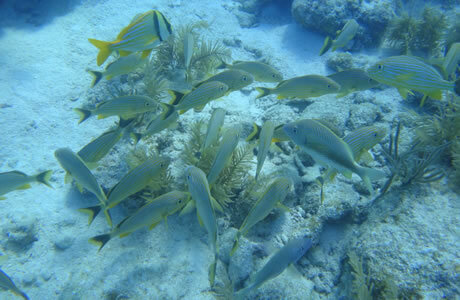 Some of the species that now call the Aquanaut their home include crabs, lobsters, spiny oysters, yellowtail, shrimp, angelfish, groupers, and others. With the clear visibility of the water, the Aquanaut is considered one of the better photographic opportunities in the waters surrounding the Florida Keys, though of course conditions may vary depending on the currents on a specific day. If you want to snap some great shots of sea life, this is a clear, colorful and beautiful site to take a dive. You'll find the Aquanaut's scattered remains at GPS coordinates 24 28.750N 081 42.980W, half a mile west of the Western Sambo Reef. There is no buoy marking the site.